British firms join trade mission for Rugby World Cup and Olympics. With a track record of staging some of the biggest and most spectacular sporting events in the world, British businesses believe they have the know-how and experience to help Japan host the Rugby World Cup (RWC) 2019 and the Tokyo 2020 Olympic and Paralympic Games. To share that knowledge and to find business partners in the run-up to the events, 19 British firms took part in a UK Trade & Investment (UKTI) mission to Tokyo in early December. While several of them already have experience operating in Japan, the majority were making an initial foray into a market with enormous potential given the tournaments on the horizon. Speaking to delegates at a reception designed to showcase the best of British off-field sporting prowess at the British Embassy Tokyo, British Ambassador to Japan Tim Hitchens CMG LVO commented that, “Sport is a national passion in the United Kingdom: it brings us together and it inspires us. And thanks to major investment in sport over the years, the United Kingdom now has a solid reputation for its ability to organise sports events on a global scale”. The event was among others held at the embassy in 2014 that focused on global sporting cooperation between Britain and Japan. These events follow the signing of a UK–Japan Host to Host Memorandum of Cooperation and Prime Minister Shinzo Abe’s May visit to London—including Queen Elizabeth Olympic Park. Previous events considered issues such as Olympic governance and financial accountability, venue infrastructure, sustainability, legacy, transport, security, communications, culture and tourism. “I was delighted when Tokyo won the right to host the Olympic Games in 2020”, Hitchens said. “It creates a unique moment for cooperation between Japan and the United Kingdom, as we are the recent and upcoming hosts of both the Summer Olympics and the Rugby World Cup”. The firms taking part in the mission are specialists in design, transport, advisory services and legacy-related work, he said, adding that one of the lessons that emerged from London 2012 was the importance of the government’s partnership with the private sector. A frequent visitor to Tokyo as a visiting research fellow at the Research Institute for Sport Business at Waseda University, David Minton is particularly keen that Tokyo should make the most of the legacy of the Games. “London was the first Olympics to have a very strong hard legacy, including [in the areas of] environment, tourism, business, sports facilities and sites with club and public use”, said Minton, who is also director of The Leisure Database Company. “London was also the first Olympics to offer the opportunity for a nationwide soft legacy that can inspire a new generation and our ‘baby boomers’. Tokyo can learn from London how to make a strong soft legacy”. Minton’s London-based firm plans and organises activities that encourage wider participation in sport through improved information and digital services. Through its sister start-up business, AiT, it is developing “the Internet of sports things” by building software platforms powered by data science. According to the firm, growth of sports apps, wearable technology and tracking devices allows for greater understanding of consumers through the collection and analysis of big data. The first global sports participation app created from the digital legacy of London 2012 is Speedo Fit, a swimming app developed by AiT and sponsored by Speedo International Limited. It is available in 112 countries, including Japan. “We know the Games will be on time, on budget and will be a spectacular example of the Japanese spirit of triumph, creativity, technological prowess, innovation and planning”, said Minton. “But I would suggest that more thought needs to be given to both the hard and soft legacy between 2020 and 2030”. To help achieve that, Minton is working closely with the Mitsubishi Research Institute, Inc.’s Vision 2020 Centre. His visit to Tokyo gave rise to promises of further talks in London with four of the main organisations behind RWC 2015. Another visitor on the mission was Dr Mike Callan, chief executive of Judospace Ltd., an educational consultancy headquartered in Bath. It makes possible improved knowledge, skills and understanding of the organisations, federations, coaches and athletes across the judo industry. “We had the opportunity to utilise the British Embassy, and the support of their staff, to provide a platform for our work and our brand”, Callan said. “It really opened my eyes to the value of our embassies and consulates in supporting British businesses”. In Japan for a total of 16 days, Callan was able to set up meetings with 10 organisations to offer services in policy advice, legacy impact analysis, details on sustainable sports development, education services and applied research that informs decision-making. “We have agreements to continue working together”, he added. “Three new contacts were as a direct result of the mission, while the others were existing ones”. In the future, Callan said he hopes that Japan will account for a “very important” part of the firm’s global business. The delegates were given a tour of some of the key locations that have been earmarked as Games venues in 2020, including the planned site of the athletes’ village alongside Tokyo Bay. Many are at present little more than empty spaces awaiting the first spade in the ground. The mission also coincided with the Legacy Co-creation Forum 2014, which addressed the long-term impact of both RWC 2019 and Tokyo 2020. “Some might argue that there remains plenty of time for consideration of social and economic legacies from your Olympic and Paralympic Games, but it was our experience with London 2012 that legacy needs to be considered from the outset in order to achieve the full benefits”, said Tim Johnson, head of the UKTI Strategic Trade team at the embassy. In London, legacy was a key element, and focused on five main themes: regenerating east London, encouraging volunteering in society, increasing sport in schools and local clubs, boosting the UK economy and promoting “Brand Britain” around the world, Johnson explained. “I have no doubt that Tokyo will organise a wonderful and well-run Olympics and Paralympics”, he added. “It is your chance to introduce the Japan of the 21st century to the world, and to remind people of the extraordinary omotenashi (spirit of hospitality) which all of us who have the privilege of living here enjoy. “It will be an extraordinary occasion, and its influence will continue for decades to come”, he concluded. From football to fencing, sport logistics and the legacy of major events to security and sustainability, Hyon-Suk Lee knows that British firms lead the world. Her new role as global sporting event project manager at the British Chamber of Commerce in Japan (BCCJ) provides the opportunity to share that fact with Japanese firms as the country counts down to two of the largest events on the sporting calendar. 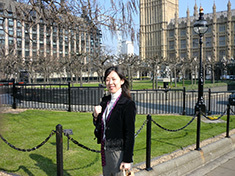 Appointed on 1 December and liaising closely with the UK Trade & Investment team at the British Embassy Tokyo, Lee has the task of communicating the greatness of British sport to potential business partners in Japan. “The BCCJ’s Global Sporting Events Division has been launched to identify and create new business opportunities for British firms operating in the sporting sphere here in Japan. “We are doing this now because we want it to provide value to stakeholders before, during and after the Rugby World Cup in 2019 and the Olympic and Paralympic Games the following year”, she told BCCJ ACUMEN. “We are covering all aspects related to these events”, she added. “It is clear that British companies have a big advantage over their rivals from other countries because of London 2012”, said Lee, who has previously worked on the FIFA World Cup Korea/Japan and London 2012. Widely acclaimed as the best Games ever staged, London 2012 has resulted in the firms that had a hand in delivering it being seen as veterans who can be relied on to both provide the advice required, and deliver on their commitments. “My task is to find the Japanese stakeholders— from companies to NPOs, research institutes, the Tokyo Metropolitan Government, the Tokyo Organising Committee and others—that are going to be looking for that sort of insight, and then to act as a bridge between them and specialist UK firms”, Lee said. One hurdle that she faces is that 2020 still sounds a long way off to many businesses here. Yet, she has been successful in getting a sense of urgency across in her meetings with Japanese firms and organisations. Another priority is to raise the profile of rugby ahead of 2019. Still something of a niche sport here, the BCCJ is in discussions with a number of other chambers representing rugby-playing nations—including Australia and New Zealand, Ireland, France and Italy—to arrange events to promote the sport.